Developer lobbyist Roger Valdez wary of council member Sally Clark's motives. The Mayor’s Housing Affordability and Livability Agenda (HALA) committee, a group of people from all sides of the housing discussion in Seattle, needs to give the council direction on a piece of legislation that deals directly with the HALA’s purview and mission—housing affordability—before council gets its political hands on it. Council members are currently up for reelection, and I’m afraid rather than assessing the basic facts, the council will cater to election season whims that could undermine the HALA’s mission. Here’s why I’m wary. Last week, growth opponent Bill Bradburd announced his candidacy for the Seattle city council against council incumbent, Sally Clark for one of the at-large positions. Clark, evidently already feeling pressure from activists like Bradburd, was the driving force on the council asking that the Department of Planning and Development (DPD) “fix" the low-rise zones because new housing was blocking “winter light” for some neighbors. They sent Clar a neighborhood petition. We think we don’t have enough housing, these neighbors think we don’t have enough sky. 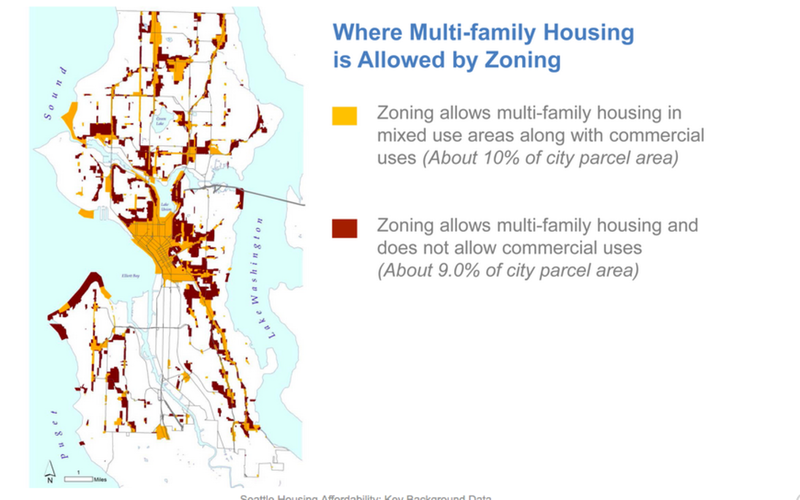 My group, Smart Growth Seattle appealed this legislation last year because the proposal will, if it passes in current form, take away as many as 6,000 units of potential housing in neighborhoods like Ballard and Capitol Hill and all over the city. Now that Bradburd is officially a candidate, I’m worried he’ll make the legislation a wedge issue which could force Clark try to speed up what otherwise would be a more deliberative process. The low-rise legislation is already on the council's planning committee agenda online. Will the city—the HALA committee, the mayor, and council—take a close look at the facts, and drown this legislation now. Some minor adjustments can be handled in other legislation that really is “fix it” legislation. Meanwhile rather than fretting over not having enough sky, maybe the city can get to work on what we really need: more housing. However, when confronted with the facts versus their political livelihood, we’ve learned elected officials, especially in an election year, will often pick keeping their jobs over doing the sensible sustainable thing. Should the HALA zoning committee truly and honestly review this proposal it’s likely they will reject it. There isn’t any rational basis to take housing capacity away at a time when demand is on the rise. What should happen is that the council should let the HALA committee do its work and hold off on any legislation that significantly affects housing until their work is done. Even $15NOW! leader-turned-council-member Kshama Sawant observed a legislative truce until the mayor’s minimum wage committee had a chance to find solutions before offering any legislation. Hopefully council member Clark will follow that example and let the committee do its work, holding off on any politically calculated legislation. Roger Valdez is a lobbyist for SmartGrowth Seattle, a lobbying group for private developers. Editor’s Note: HALA committee chair Faith Pettiss told PubliCola there was no friction between HALA members and council and that the HALA was scheduled to evaluate the LR3 legislation well before the council takes it up. Pettiss added that the committee has a collaborative working relationship with Clark; Clark oversees the HALA committee as a steering committee member. Clark has not returned my call to address Valdez’s accusations.